If you look around this here blog you will see that I have a few different types of cinnamon rolls. Sometimes I think I am a little obsessed with the whole yeast cinnamon rolls. I guess I can blame that on my mother. As I have mentioned before my mother made a lot of bread in her day. I have two sisters and my mom made sure that each one of us could bake bread. It is a tradition thing sort of. Bread making goes way back in my mom’s family. But believe me I am not complaining. I find bread making is calming for me. Maybe it is all the kneading that goes into the bread making or maybe it is because I am a huge fan when it comes to eating bread. Homemade bread was served at every meal when I was a kid, so how could I not love the stuff? As far as the cinnamon rolls I love making them for breakfast. I am a breakfast person and love all sweet and savory dishes. I made yeast bread with honey for these cinnamon roll muffins; the bread part of the roll is not as sweet as some cinnamon rolls are. The filling is your basic butter, cinnamon, and sugar that you will find in your average cinnamon rolls. 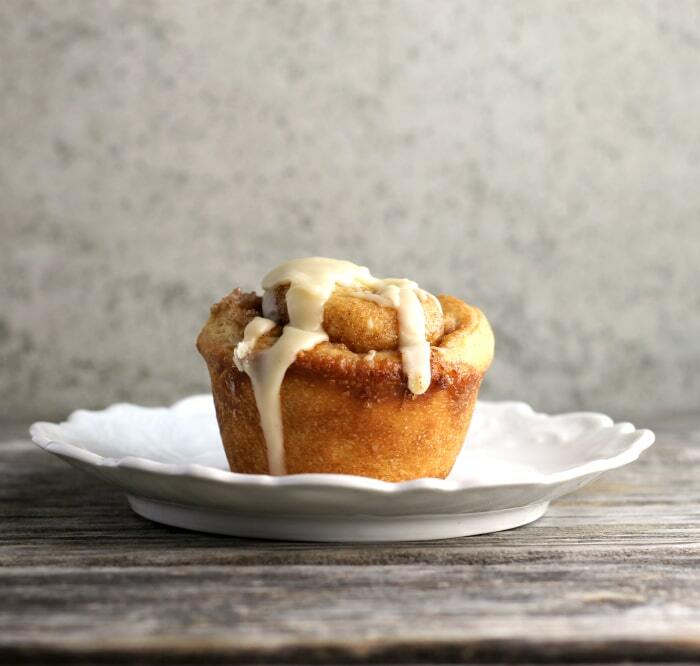 I topped these cinnamon roll muffins off with a penuche frosting. Heat the milk and 1/4 cup butter in the microwave to 120 to 130 degrees F. Add to the flour mixture and mix in. Add the honey and egg, mix until combined. Gradually add the rest of the flour. Knead the dough until smooth. Let rest for about an hour or until double in size. When the dough is has rested and is double in size divide into two equal parts. Melt the 3 tablespoons of butter. Mix the 1 1/2 teaspoon with the granulated sugar and brown sugar for the filling. Roll the dough into 12 by 10-inch rectangles. Spread with half of the melted butter then sprinkle half of the sugar and cinnamon mixture over top of the butter. Roll the dough the tightly. Cut into 12 equal parts. Place in a well greased muffin tins. Repeat with second half of dough. Let the rolls rest for about 1/2 hour. Preheat the oven to 375 degrees F.
Once the rolls have rested for 1/2 hour place in the oven and bake for 12 minutes or until lightly brown. Remove from tins once they come out of the oven and let cool completely on cooling racks. 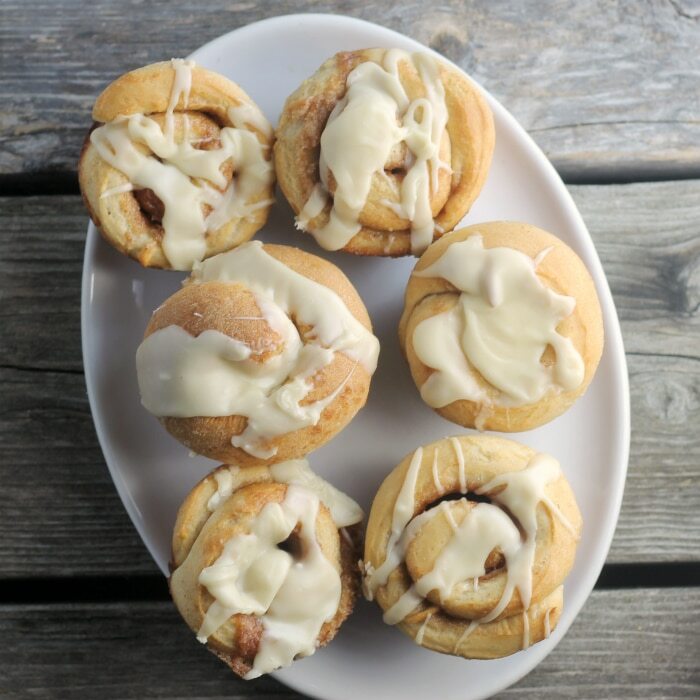 While the sweet rolls are cooling make your frosting. In a small sauce pan combine the 2 tablespoons brown sugar, 2 tablespoons butter, and 3 tablespoons cream. Heat over medium heat until it comes to a boil, continue to boil for a minute or two. Remove from heat and cool slightly. Add enough powdered sugar for the right consistence for frosting. Frost cooled the cooled cinnamon roll muffins. These look and sound just fabulous, Dawn! I love baking bread too. Somehow baking bread always relieves any stress I’m feeling. Have a great weekend! This looks like my kind of breakfast, Dawn! 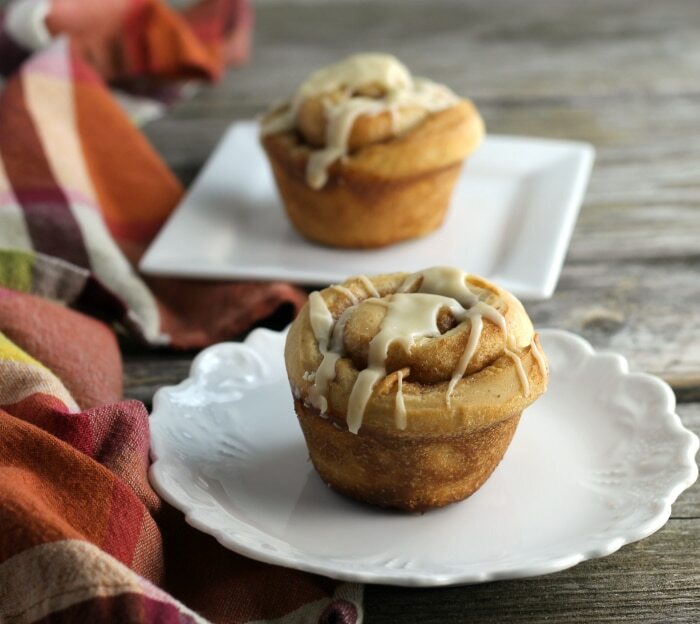 Like you, I’ve always had a thing for cinnamon rolls…and muffins are just the best for a handheld breakfast. I’m going to go to sleep tonight and wish that these will magically appear in my kitchen tomorrow morning! 🙂 Have a great weekend, my friend! How wonderful to have learned how to bake bread from your mother! These muffins look seriously delicious. I’ll just take one while no one is looking. 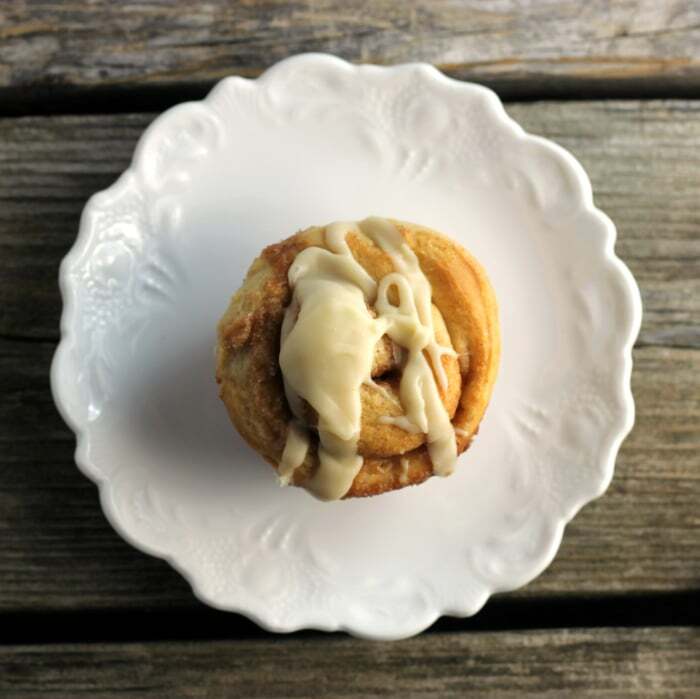 I have a plethora of cinnamon roll recipes on my blog, too! Need to test out your beauties next—they look amazing!